Click on the icon above to submit a nomination online. This District level award is representative of the adult Scouter who has started the journey to making a difference in the life of a Scout. As was Lord Baden-Powell, this adult leader is a trusted mentor, guide, and protector of youth. The nominee nurtures and develops youth to become leaders of character, in physical and moral fitness, in sound citizenship, and exemplify a life following the Scout Oath and Law. This recognition comes without the previous knowledge of those chosen. Who, as Baden Powell did in his day, is making a difference in the life of Scouts, adult Scouters. This next level District recognition is awarded to adult Scouters who have gone the extra mile in serving Scouts in the Unit or District. It is conferred upon an individual in recognition for ongoing and extraordinary service. The Second Miler may be awarded multiple times. This recognition comes without the previous knowledge of those selected. Has shown a consistent willingness to go the extra mile to provide an outstanding Scouting program. Has sought out training opportunities to improve and apply the Scouting program. Click icon above for District Award of Merit information. The District Award of Merit is a Council award and is the highest recognition for District level service. The National BSA allotment of the award is 1 per 25 Scouting units. It is awarded to Scouters of exceptional character who render service of an outstanding nature at the District level, and in service to community and church. It is never sought after and comes without solicitation. It is a National BSA recognition and becomes part of the individual's BSA record. It is bestowed only once to a Scouter. Teaches and leads commissioners, Scouters, families, and community leaders how to better use the Cub and Boy Scouting programs. Provide exceptional service within the community and outside of Scouting. General Information. Candidates cannot nominate themselves; to avoid disappointment, if not selected, nominees should be unaware of their being considered. 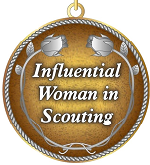 Nominations are submitted to Angela Shelley (801-437-6221) at angela.shelley@scouting.org. Women approved for this recognition will be honored at a formal banquet in May at the Brigham Young University's Sky Room. Nomination Forms Those nominating candidates should carefully follow the procedures (including due dates) before submitting. The district Key 3 is available to offer advice and support. Register to Attend the Event The event includes a reception, a dinner, and an awards presentation. Family of awardees and others are invited to attend. Click on the icon above to complete, print and deliver a nomination to the Key 3. Click this icon to review Commissioner Roles. Requirements Overview. The Distinguised Commissioner Service Award is the highest recognition that can be given to someone serving in a stake (sub-district), community, district or council commissioner capacity. It recognizes an individual who has consistently engaged in distinguished and exceptional commissioner service resulting in significant, positive impact on youth, units and a district and/or council. In determining the value of such service, consideration must be given to the candidate's commissioner position and the corresponding opportunity to render outstanding and exceptional service beyond the expectations for the commissioner position, for at least five continuous years. 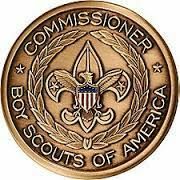 In order to be considered for the Distinguised Commissioner Service Award, a candidate must be nominated by a currently registered adult member of the Boy Scouts of America. To prevent embarrassment, should she/he not be selected, a candidate should not be aware of his/her nomination until advised by the council selection board or their representative. The Distinguished Commissioner Service Award may be awarded once to a commissioner. 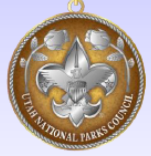 There is no restriction on the number of recognitions that may be awarded by the Utah National Parks Council during a calendar year. If approved for the award, the individual is recognized at an appropriate Council or District event. Prerequisite details, Procedures & Nomination Form. Those nominating candidates should carefully consider and follow the prerequisites and procedures before submitting. The District Key 3 is available to offer advice and support. Click icon above to complete, print, then deliver a nomination to the Key 3. Click icon above for Silver Beaver information. 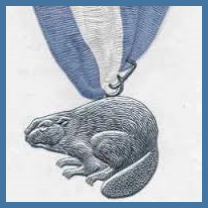 Introduced in 1931 the Silver Beaver Award is the council-level distinguised service award of the Boy Scouts of America. Recipients are registered adult leaders, of exceptional character, who have made a significant, positive impact on the lives of youth and adult volunteers, and have provided notable service to the council and community. This recognition is extended to those who implement Scouting in a remarkable manner and provide many years of extraordinary and influential civic service. The Silver Beaver is never sought after and comes without solicitation to those who are selected. To prevent embarrassment, should he/she not be selected, a candidate should not be notified of his/her nomination until advised by the council selection board or their representative. Has profoundly influenced Scouting and community youth programs in such a manner as to affect, in positive ways, many outside a district. Extensively built lives of character in youth, based on the priciples of Lord Baden-Powells's Scout Oath and Law. Generally has 15-20 years of service, is registered, and has extensive training in Scouting programs and methods. Has previously been awarded a District Award of Merit. The completed nomination is turned in to the District Key 3 for review at least three weeks before the May 1st due date to the council. The council board convenes to consider all nominees, it notifies selectees about July 1st. A council wide recognition ceremony is held for all awardees, their families, and guests on a Saturday in September. Why: Recognitions demonstrate to youth that adults take youth advancements seriously, while thanking adults for their service. It enforces the role Scouting plays in strengthening families, churches, and communities, and sponsors and youth leaders take greater ownership of Scouting. How: Nominations may be submitted through the above options from April 1st of the current year through January 31st of the following year. A district board convenes to review and approve nominations by the third week in February. When: District Recognition Ceremonies are held the last Thursday of each March. Locations are determined annually. Many don’t have the background on persons they would like to nominate. The Council Service Center in Orem, Utah is available to provide a non-sensitive Service History (“Scoutnet”) listing Positions, Training, and Awards on anyone registered with the BSA.